After years of deliberation, Wendy Willrich, with the support of her husband, Mason, decided that the Crocker Art Museum should become the ultimate home for her collection of 41 early California paintings. Willrich describes these paintings as close friends, having lived with some of them for as long as 50 years. The paintings are mostly landscapes — though two are still lifes — and they feature scenes from the northern, central, and southern parts of the state. These include sweeping vistas of mountains, the coast, and other places Willrich likes to visit, as well as quieter, pastoral locales in Marin and Alameda Counties, which she knows well from having lived many years in Piedmont. Guy Rose (American, 1867-1925), Gathering Storm, High Sierra, circa 1916. Oil on canvas; Crocker Art Museum, Wendy Willrich Collection. Most art created in California between the 1870s and 1940s — the span represented by paintings in the Willrich Collection — manifests a profound sense of place. As with American art generally, the best California art of this period was founded upon a sincerity derived from a close communion between the artist and the land. From its beginnings, being physically isolated by distance and topography, California art has been separated from the mainstream. This should not imply, however, that California’s artists have been unaware of national and international aesthetic movements or trends. Historically, a vast number of the Golden State’s artists have not been native, but transplanted from other parts of the country or world, and many perfected their craft by training elsewhere. After the turn of the century, work by artists that the Crockers acquired began to fall out of favor, and all but the most famous California artists began to languish in obscurity. Even those that had been famous in their own lifetimes were now considered minor figures. This began to change in the 1960s and 70s, when 19th-century American art generally again began to be nationally appreciated. Like their eastern counterparts, California artists were re-examined, their contributions slowly reassuming their rightful place in art history. Recognition has since come in the form of books and catalogues, exhibitions, and escalating prices of the art itself. Cattle Watering, Marin County, 1918. Oil on canvas, 20 x 36 in. Wendy Willrich Collection. Within this early period of reappreciation, Wendy Willrich was among a small and forward-looking group of collectors of late-19th and early 20th-century California paintings. Having been inspired by a 1965 docent-training course at the Oakland Museum (now the Oakland Museum of California), she acquired her first artwork a year later — a bucolic scene by Marin County painter Thaddeus Welch, which she still owns. Other paintings followed, purchased from dealers and at auction. Because very little scholarship yet existed on the artists whose work she was buying, Willrich followed her instincts. John Marshall Gamble, A Spring Morning, Poppies and Bush Lupine, circa 1915. Oil on canvas, 25 x 40 in. Crocker Art Museum, Wendy Willrich Collection, 2017.52. The Willrich gift is transformative and will contribute immensely to the Museum’s unparalleled display of California art. “I selected the Crocker because it is important to have my collection in Sacramento, the capital of California,” says Willrich. “Moreover, I know that my collection adds great value and depth to the excellent collection of California paintings that already exist at the Crocker.” The staff and board of the Museum are in complete agreement and absolutely thrilled to be the recipients of Willrich’s generosity. In 2016, Elaine and Sidney Cohen of Phoenix, Arizona, donated an important group of contemporary American ceramics to the Crocker. In terms of decoration, examples in the collection range from the bold minimalism of Jun Kaneko and Claude Conover to the figurative exuberance of Rudy Autio and husband-and-wife potters Edwin and Mary Scheier. Some works are expressively raw, like those by Don Reitz and Tim Rowan; others, such as the porcelain works by Tom Rippon and Nobuhito Nishigawara, are elegantly refined. There are pieces that hint at functionality but are not meant to be used, including a covered jar by Viola Frey and the teapot-based forms of Rick Dillingham and Peter Shire, whereas other works are purely sculptural. Despite these differences, all extend the traditional boundaries of clay, just as the Cohen Collection itself expands the Crocker’s holdings and further reinforces its position as a leader in collecting and exhibiting ceramics. Elaine and Sidney Cohen began collecting clay pieces early in their marriage, typically as they were hunting for American wood furniture in dusty barns and antiques shops. They were drawn to Red Wing crockery in various sizes, which they intended to use for storage or as table bases. They also liked and collected Bennington spatterware, which was both attractive and functional. When they moved from the Chicago suburbs to Phoenix, and eventually to a 1987 Taliesin-designed home with built-in spaces perfect for pottery, they started to acquire the works included in this collection. They had no definite plan to form a collection, but simply purchased work they liked until one day a collection was formed. Over time, they came to know Edwin and Mary Scheier, Rudy Autio, Jun Kaneko, and other ceramists personally, which deepened their appreciation. They decided to gift much of their collection to the Crocker because it filled notable gaps in the Museum’s holdings and expanded upon its existing strengths. Edwin Scheier (1910-2008), Vessel. circa 1999. Glazed stoneware, 22 1/2 x 12 x 12 in. Crocker Art Museum, gift of Elaine and Sidney Cohen. Many of the artists whose work is included in the Cohen collection are represented by multiple pieces, making evident their evolution and breadth of achievement. The collection boasts particularly strong examples by the Scheiers, who are known for finely thrown functional vessels with sgraffito or applied surface decoration. Mary was an expert on the wheel and threw thin-walled pots often inspired by Chinese and Japanese forms; Edwin created colorful glazes, combining them with motifs drawn from folk traditions, the Bible, African and Oceanic art, archaeology, the natural world, and modern painting styles. The Scheiers lived for extended periods in New Hampshire; Oaxaca, Mexico; and, finally, Arizona. In Oaxaca, Mary developed arthritis and stopped throwing. For a time, Edwin concentrated on weaving, producing works on paper, and making sculpture. He later returned to clay in earnest, throwing and decorating spectacular, expressive vessels such as those in the Cohen Collection. Rudy Autio (1926-2007), Animal Fair. 1984. Glazed porcelain, 14 ½ x 13 x 13 in. Crocker Art Museum, gift of Elaine and Sidney Cohen. Rudy Autio is also represented by multiple pieces, which collectively show his progression from abstraction to figuration. Born in Butte, Montana, he remained in his native state for much of his career, teaching at the University of Montana for 28 years. He was, with ceramist Peter Voulkos, a founding artist at the Archie Bray Ceramics Foundation in Helena. Though best known for his figurative ceramic vessels, he also made prints and paintings and worked in bronze, concrete, glass, metal, and textiles. In clay, he influenced countless artists and has been called the “Matisse of Ceramics” because of his colorful figures and animals, which enwrap his biomorphic forms. Jun Kaneko (American, born Japan, 1942), Untitled Platter. 1987. Glazed stoneware, 3 x 25 3/4 x 20 3/4 in. Crocker Art Museum, gift of Elaine and Sidney Cohen. Jun Kaneko studied with Peter Voulkos, Paul Soldner, and Jerry Rothman, and has since become one of the world’s leading ceramic sculptors. He has been included in group and solo exhibitions internationally and is represented in the Cohen collection by “chunks,” platters, and a slab piece, all of which showcase his unique, minimalist approach. Kaneko came to the United States from his native Japan in 1963 to study at Chouinard Art Institute. There, he met ceramics collector Fred Marer, who exposed him to the possibilities of sculptural ceramics. In the 1970s, Kaneko taught at the nation’s leading art schools, including Scripps College, Rhode Island School of Design, and Cranbrook Academy of Art. Since 1986, he has been based in Omaha, Nebraska, creating large-scale, hand-built sculptures in clay that are enlivened by glaze abstractions. 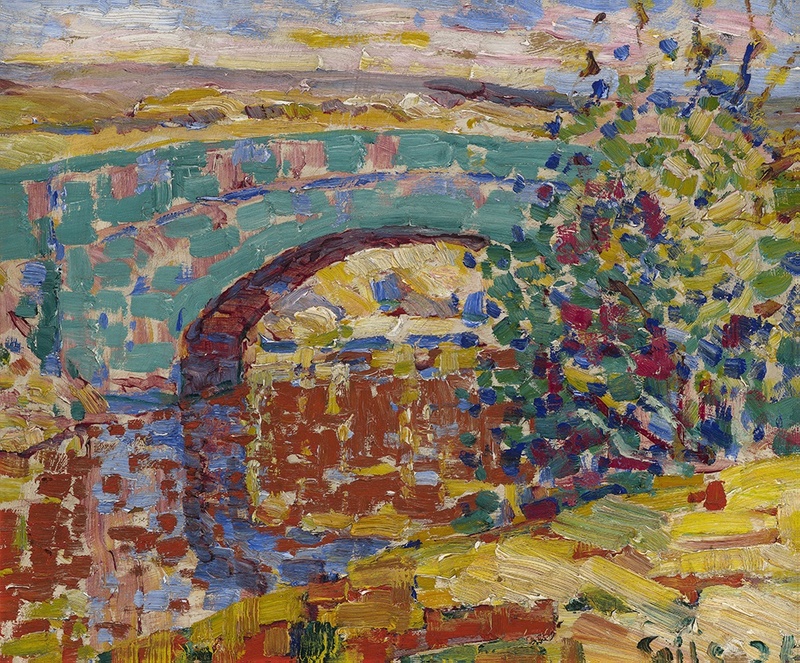 Cover image: Selden Connor Gile, Desert Bridge/Holbrook, circa 1926. Oil on board, 14 x 17 in. Wendy Willrich Collection.